What do the “unsold” and “overhang” numbers mean in the residential property market? Home > Featured > What do the “unsold” and “overhang” numbers mean in the residential property market? Posted on October 19, 2018 | 6565 views | Topic : Featured, Featured Articles, Latest News, News & Articles, Property News. The issue of supply-demand imbalance in the property market has been highlighted since 2015, and the number of overhang and unsold residential properties in the nation have worsened every year. What do the “unsold” and “overhang” numbers mean in the residential property market? In the first quarter of 2018 (1Q 2018), the unsold residential units stood at 100,459 units, increasing from 99,246 as of 2017, according to the Napic Stock and Status Residential Q1 2018 report. Once the developer begins to construct the house, the units under construction will be moved to the unsold under-construction property category if it remains unsold more than nine months. High-rise developments and properties priced below RM300,000 are the property segments with the highest unsold rate. 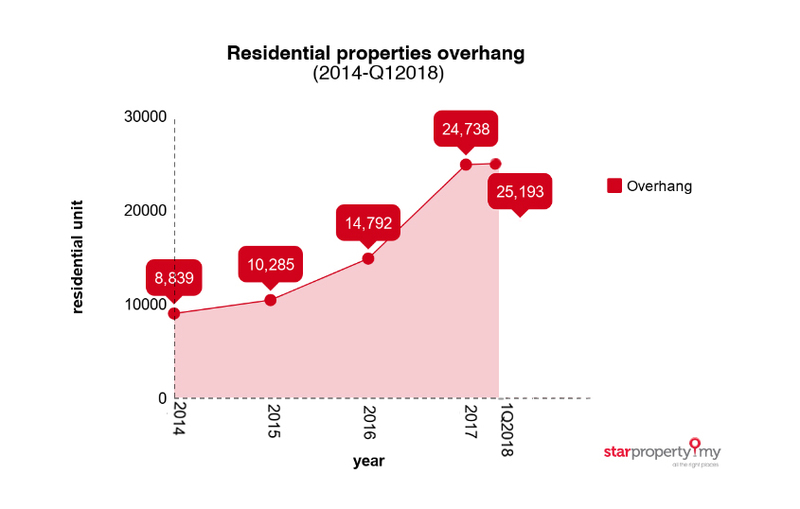 In Bank Negara’s box article titled “Imbalances in the property market,” the factors that hamper the take-up rate of these properties include unattractive location and low connectivity. Moreover, non-creditworthy loan applicants and the public preference toward landed properties over the high-rise housing products also lead to the increase of unsold numbers in these housing segments.